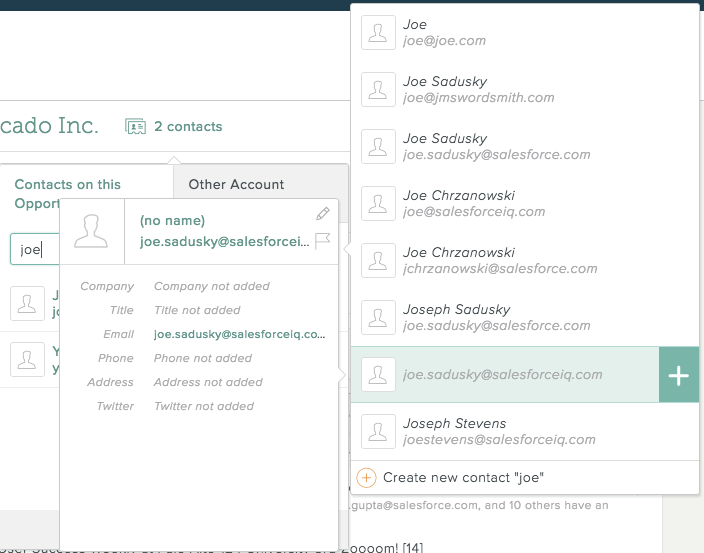 Learn more about your contacts and your organization's contacts and accounts in SalesforceIQ. 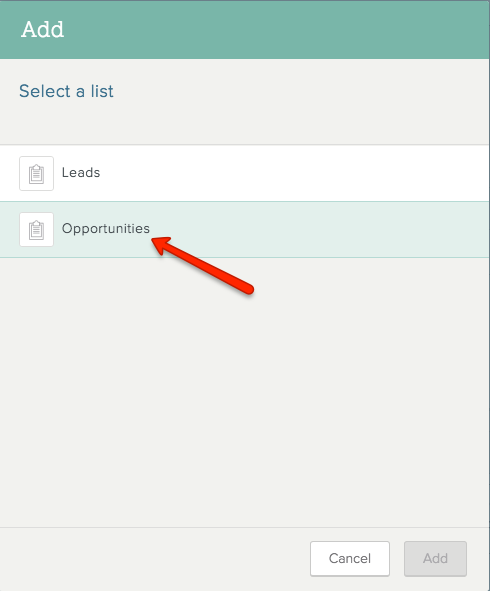 Lists in SalesforceIQ are comprised of leads, opportunities, deals, and so on. These items can be either individual Contacts or Accounts. 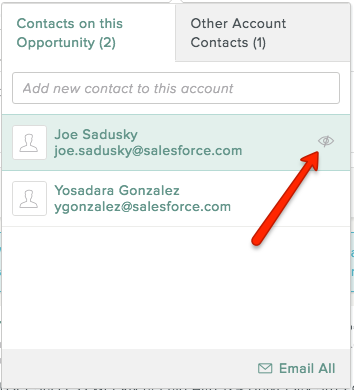 In SalesforceIQ, Contacts are the individual people, or points of contact, a user adds to a List and/or an Account. By comparison, an Account refers to the Accounts a user adds to a List. Accounts are comprised of all the Contacts in that Account. For instance, Jim, Pam, Dwight, and the rest of the individuals who work at Dunder Mifflin are Contacts. Dunder Mifflin itself is the Account. 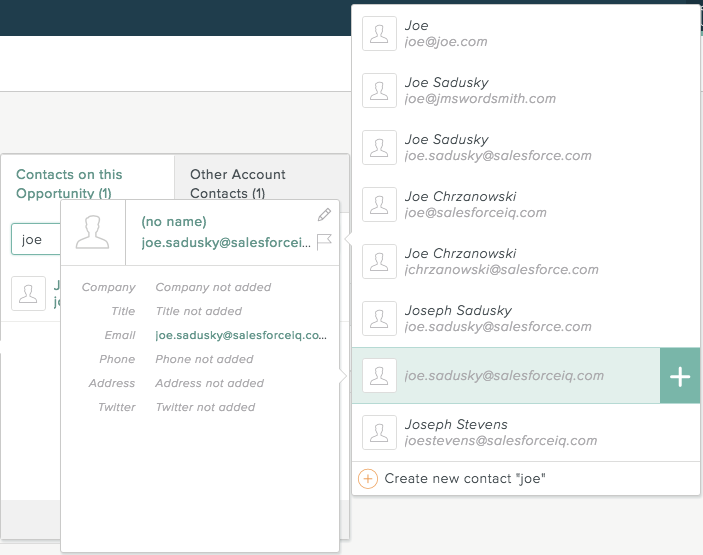 The SalesforceIQ Contact Gallery gives you a single centralized place to add and manage all your SalesforceIQ Contacts. 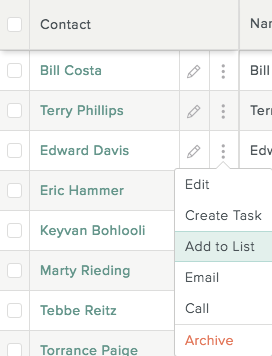 Because the Contact Gallery is set up simiiarly to a List Grid, you can also create and delete Contact properties (shown as columns in the Gallery); hide and reorder columns; and sort columns in the same way you can with Grid fields. 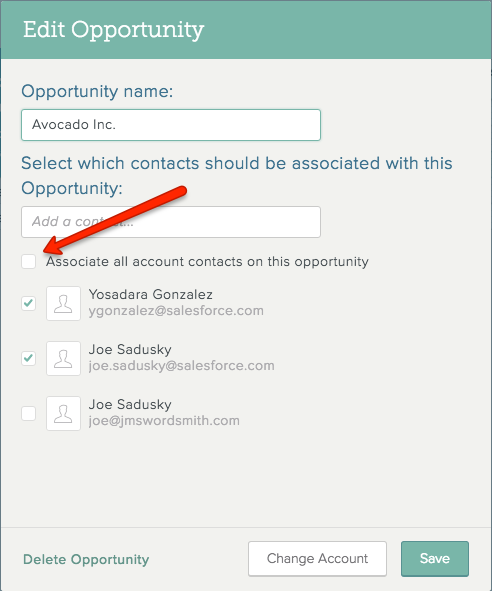 In SalesforceIQ, every object you add to a List—a lead, opportunity, etc.—is associated with either an Account or a Contact. If you want activity for a List object on an Account-based List to appear in the Stream view, you must add one or more Contacts (also known as Point of Contact) to that List object. 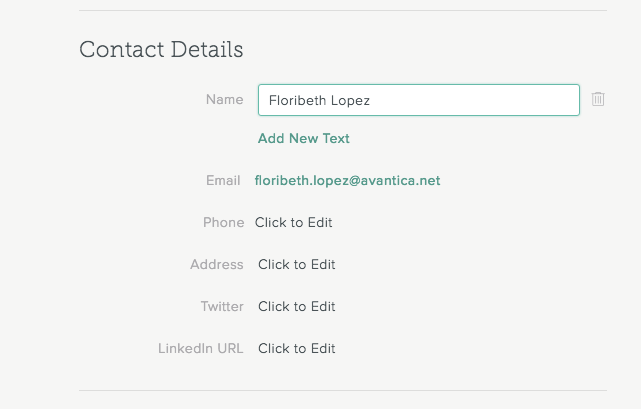 Adding a Contact with an email address or phone number populates email and event communication in the Stream, and auto-populates data in the Grid with our Intelligence Fields. 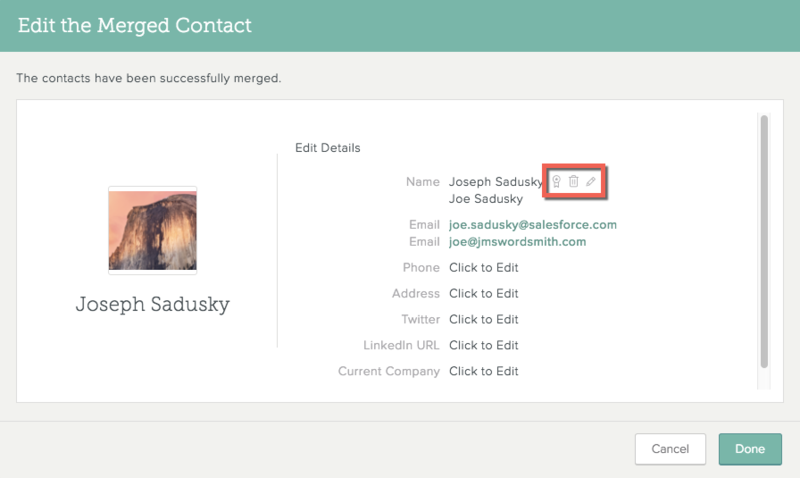 You can also remove a Contact from an Account List object from the Stream, Grid, or Account Profile page. If the Stream view isn’t displayed, click in the upper-left corner of the screen, and then click the Account List object you want in the left panel. At the top of the Stream, click X contact(s). 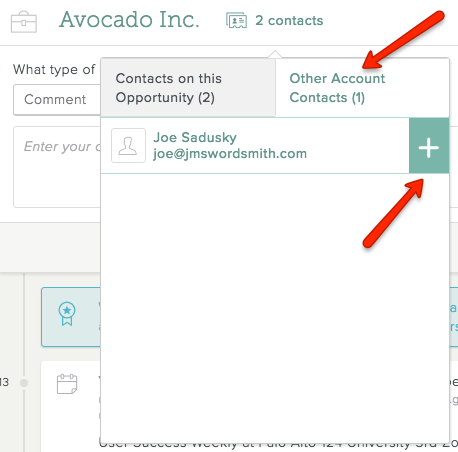 If the Contact you want to add is already associated with the Account—Click the Other Account Contacts tab. Hover over the Contact name and click + that appears to the right. 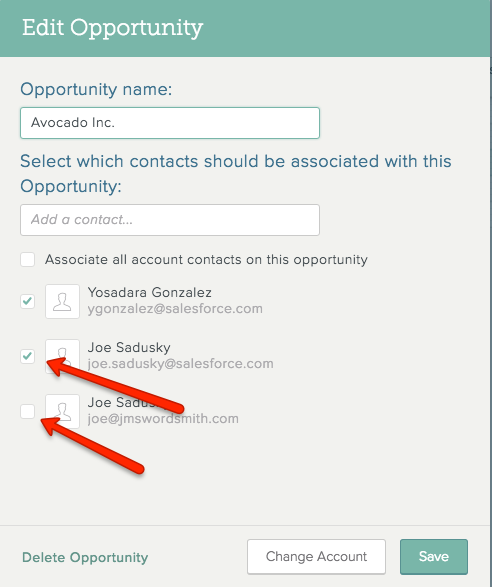 To add an existing Contact to both the Account and the List object—Type the Contact name in the Add new contact to this account box. Select the Contact from the search results. 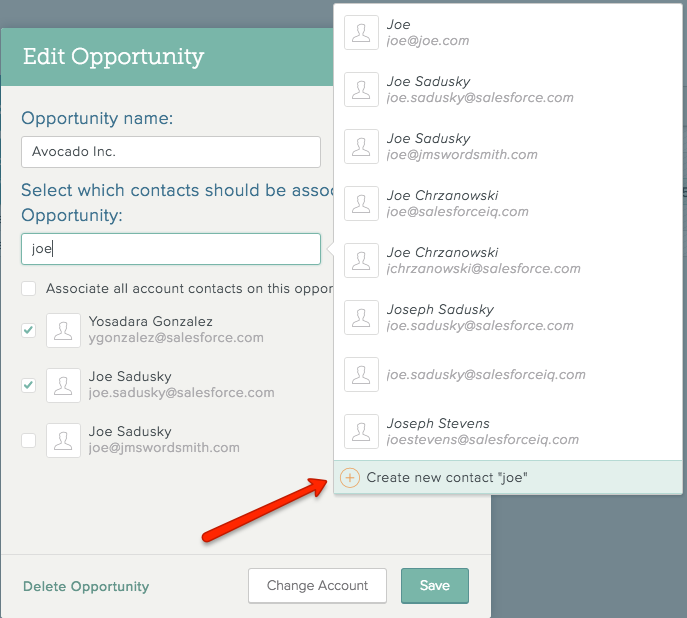 To create a new Contact and add it to both the Account and the List object—Type the Contact name in the Add new contact to this account box. Click Create new contact at the bottom of the search results. Enter the name, phone number, and email address, and then click Create. In the List Grid view, click to the right of the lead, opportunity, etc. name. 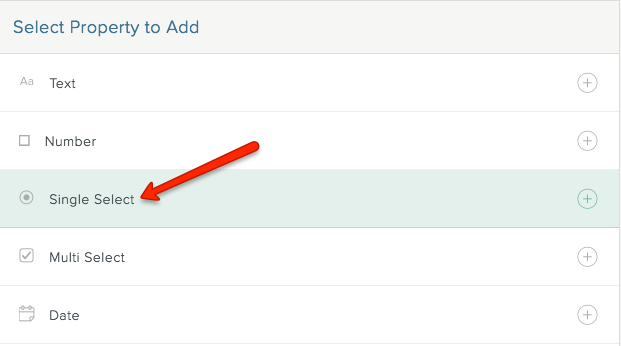 To associate all Contacts on the Account with this List object—Check the box directly below the Add a contact field. To associate individual Contacts on the Account with this List object—Check or uncheck the boxes next to the Contact names. 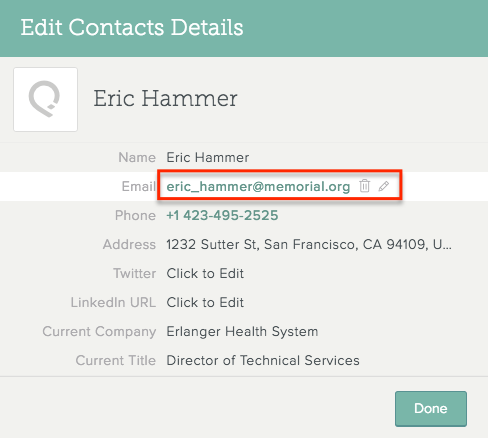 To add an existing Contact to both the Account and the List object—Type the Contact name in the Add a contact box. Select the Contact from the search results. 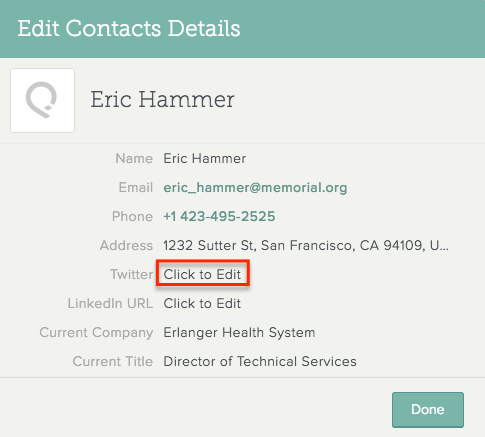 To create a new Contact and add it to both the Account and the List object—Type the Contact name in the Add a contact box. Click Create new contact at the bottom of the search results. Enter the name, phone number, and email address, and then click Create. Enter the Account name and select the Account from the search results. Note: Alternatively, you can browse to the Account by clicking at the top of the screen, selecting Accounts, and then clicking the Account name. In the table at the top of the Account Profile page, click X Contact(s). On the Contact Profile page, click Add to List. Select the Account-based List to which you want to add the Contact. Note: If you want to add the Contact to a Contact-based List, follow these steps instead. On the screen that appears, enter the name of the Account you want to create. Click Create new account [name] at the bottom of the search results. 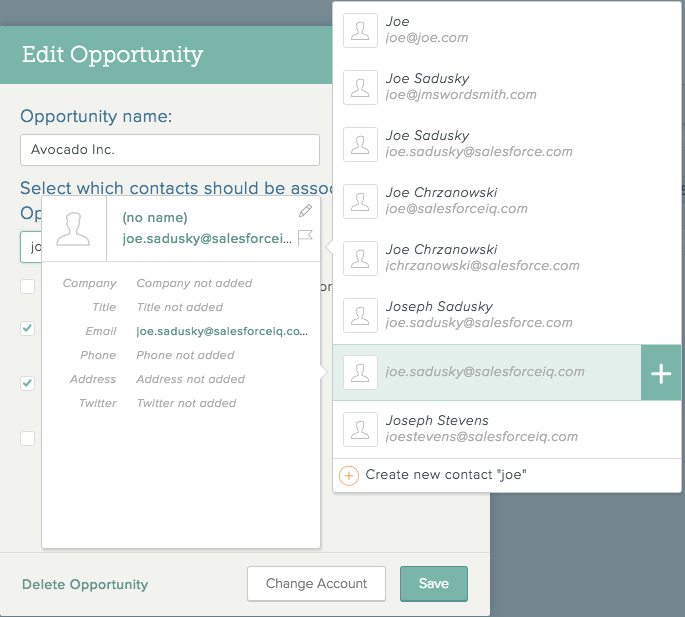 A default name is displayed the List object—for example, the opportunity name for an Opportunities List. This is the name that appears in the Grid view. Edit the name if desired. It can be the same as or different from the Account name. The Contact from the Contact Profile page is automatically added to the Account and the Account List object. It appears under the Add a contact field. 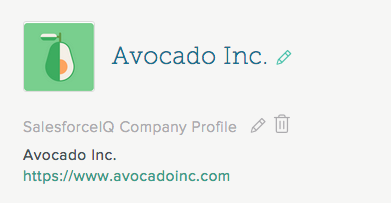 To add an additional Contact to the Account, enter the Contact name in the Add a new contact field. 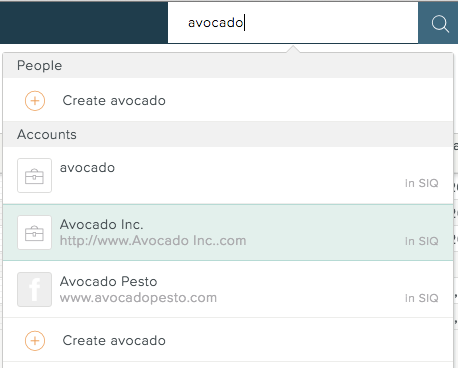 To add an existing Contact to both the Account and the List object—Select the Contact from the search results. To create a new Contact and add it to both the Account and the List object—Click Create new contact at the bottom of the search results. Enter the name, phone number, and email address, and then click Create. Repeat step 9 to add additional Contacts. On the screen that appears, enter the name of the Account with which you want to associate the Contact. Select the Account from the list of matches. 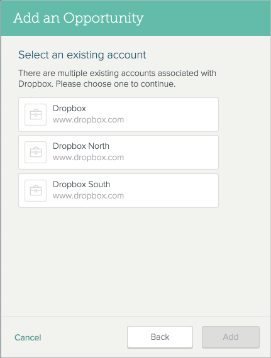 If multiple Accounts exist for the Account you selected, they are displayed. Click the one you want to use. 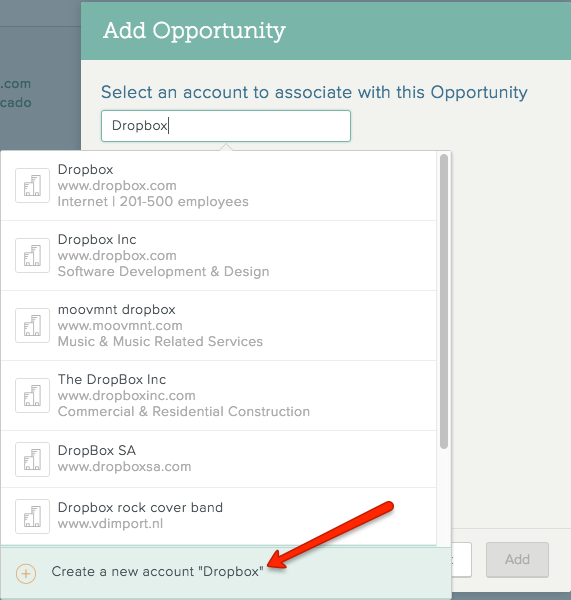 If a List object doesn’t yet exists for the Account you selected—A default name is displayed the List object—for example, the opportunity name for an Opportunities List. This is the name that appears in the Grid view. Edit the name if desired. It can be the same as or different from the Account name. If one or more List objects already exist in your List for the selected Account—The objects are displayed. To edit an existing object, click it. To add a new object, click Add a new [List object] with this account. Repeat step 10 to add additional Contacts. Check the boxes to the left of the Contacts you want to add to the List object. Click Add to List. Note: You can also add a single Contact to a List by clicking to the right of the Contact name and selecting Add to List. Removing a Contact from a List object removes the Contact from that object on that List. The Contact still remains in your address book and is still associated with the Account. You can remove a Contact from an Account List object in the Stream, the Grid, and the Account Profile page. From the Stream view or the Account Profile page—At the top of the Stream or in the table at the top of the Account Profile page, click X Contact(s). On the Contacts on this [List object] tab, hover over the Contact name and click [icon]. 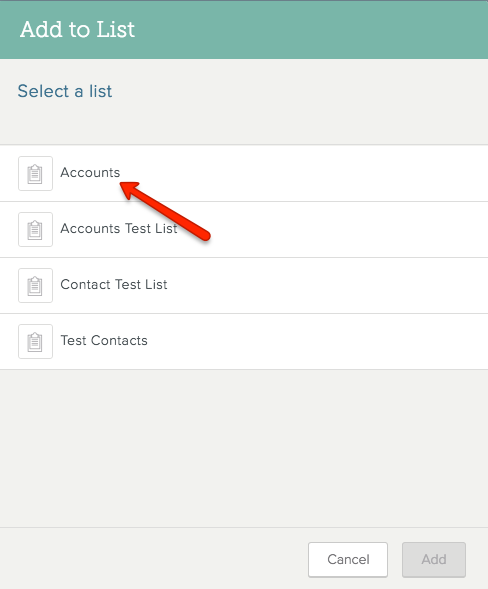 This removes the Contact from the List object and moves it to the Other Account Contacts tab. 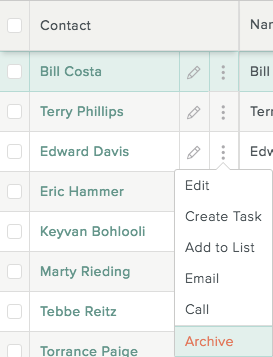 From the Grid view—Click to the right of the List object name. Uncheck the box to the left of any Contact name to remove it from the List object. Click Save. 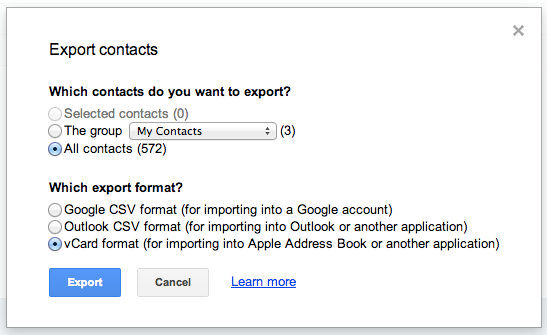 These default Contact properties also appear as fields in the Contact Gallery. Organization admins can also create custom Contact properties. 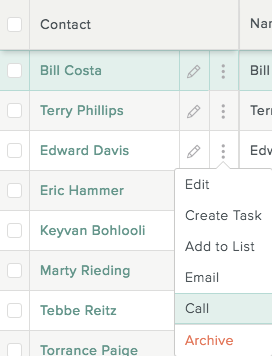 For Contact-based Lists only, you can add any existing Contact property as a field in the Grid. On the screen that appears, select Contact as the field type, and then select from the options that appear. Note: You can add multiple values for Name, Email, Phone, and Address Company properties. Navigate to the Contact Profile page either via search, from the Contact Gallery, or by clicking the Contact’s name from the Stream. Scroll down to the Contact Details or Experience section. To add a new Company property—Click Add new and enter the information. To edit the property information—Click in the field and enter the new information. To delete the information—Click . To make the information primary if you have more than one entry for that information (for example, multiple email addresses)—Click . 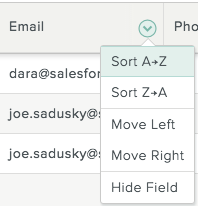 If the Contact property has been added to a Contact-based List as a field, you can update it from the Grid like any other field type. You can also update any Contact property from the Contact Gallery. Note: You can’t edit the Current Company Duration or the Company History fields from the Contact Gallery or the Grid. 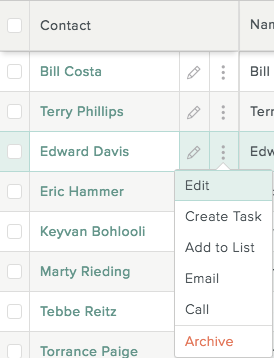 Grid: Click on the Contact-based list. Contact Gallery: Click and then select Contacts. For a List, confirm that the relevant Contact property has been added as a field to the List. 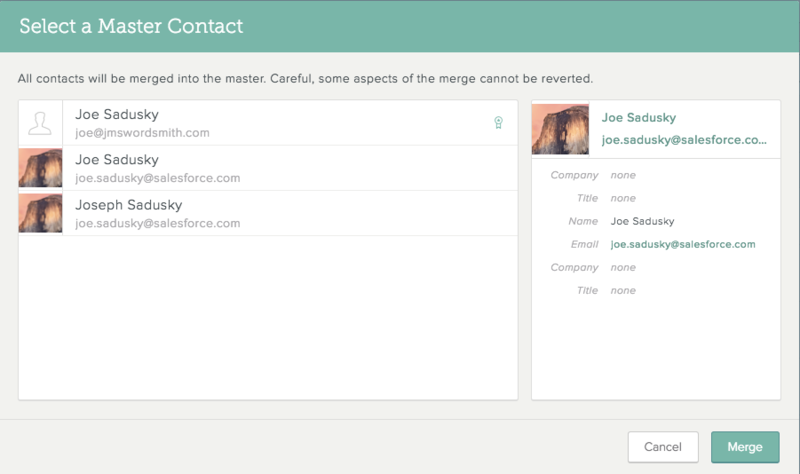 The Contact Gallery displays all Contact properties by default. 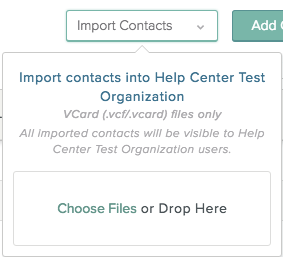 Find the Contact you want to update by filtering or searching in the List or Gallery. 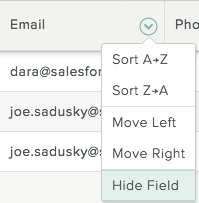 View multiple values for Company properties in the Grid—If you have a Name, Email, Phone, or Address field with multiple values, double-click in the field to view all the values. Multiple values are indicated by a blue triangle in the upper-right corner of the field. 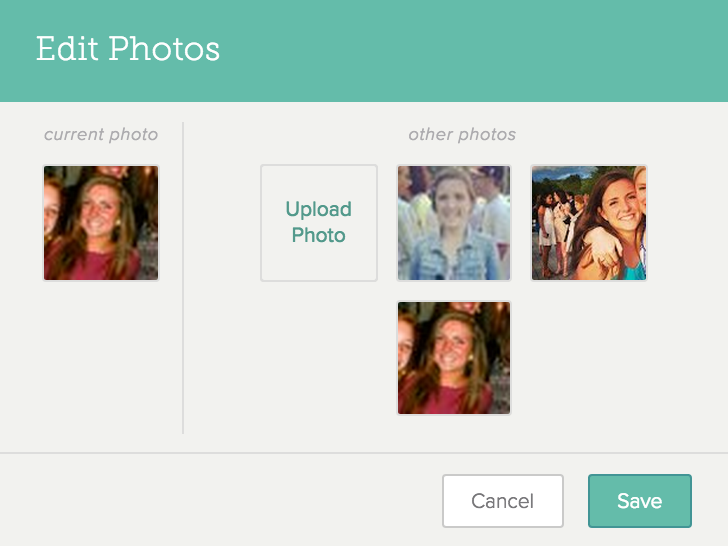 Filter and sort in the Grid—You can filter and sort Contact properties in the Grid, so users can create unique filters and saved filters. 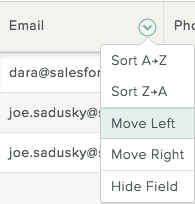 Customize Contact properties in the Contact Gallery—You can sort, reorder, and hide/show Contact properties displayed in the Contact Gallery. 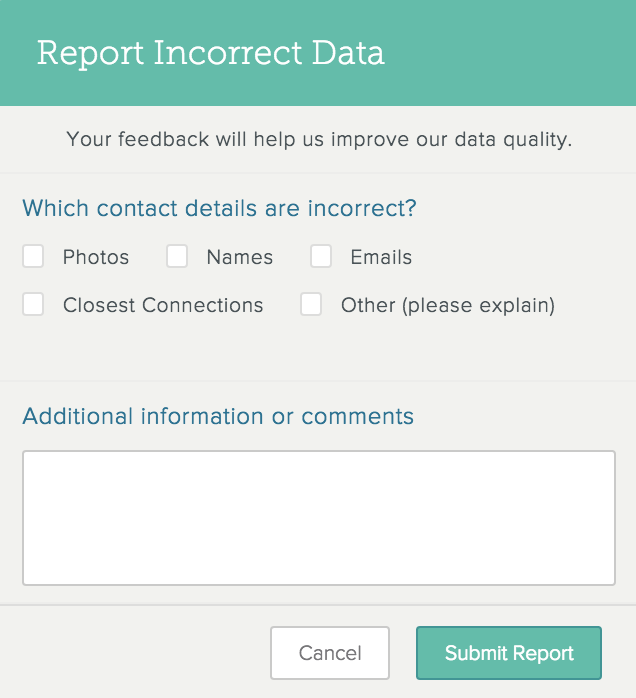 Reporting—Currently, you can’t report on default Contact properties. Contact properties are details about your Contacts that you store on the Contact Profile page. 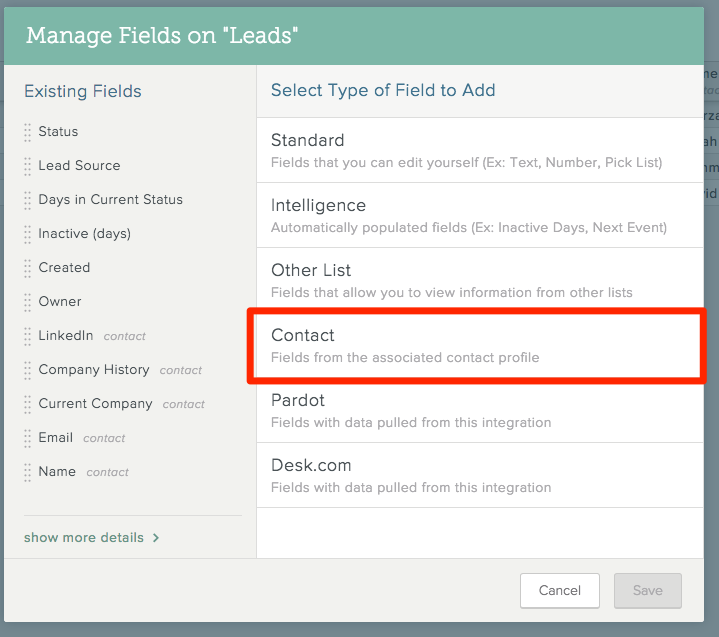 All users can add or edit the default Contact properties available in SalesforceIQ. In addition, admin users only can create custom Contact properties, as described here. 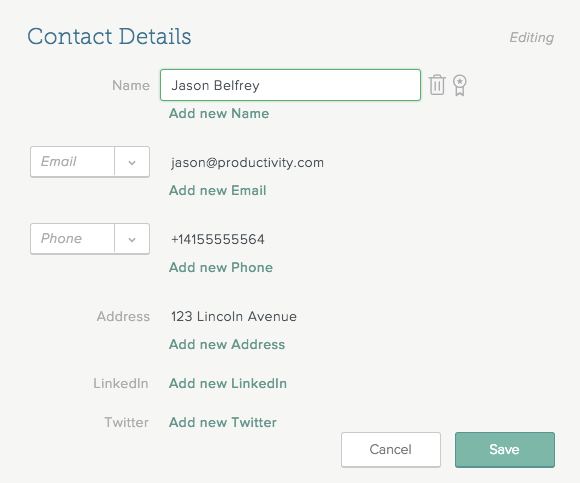 After an admin creates a custom Contact property, it appears on the Contact Profile page and Contact Gallery and can be added to the Grid on a Contact-based List as a Contact field type. 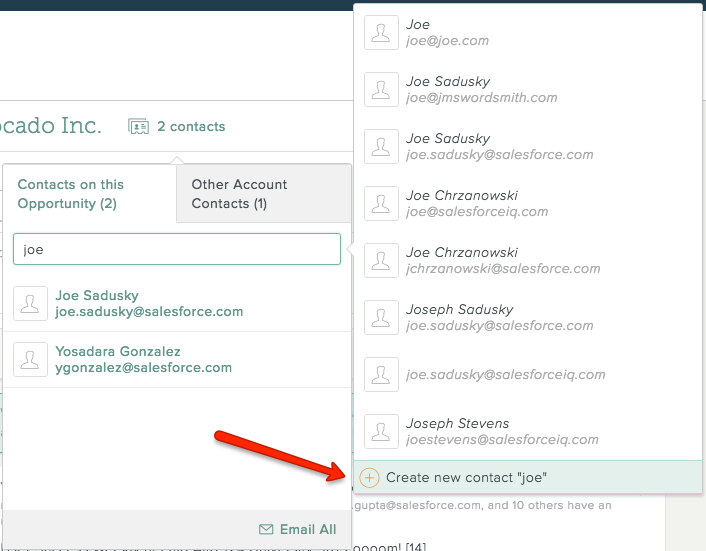 An admin can create a custom Contact property from the settings or from the Contact Gallery. On the screen that appears, click Contact Properties. 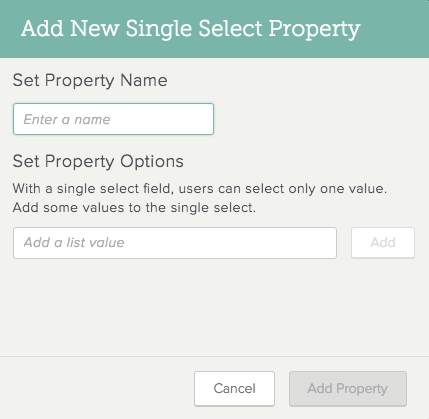 Click the property type you want to add—Single Select in this example. Enter the property information and click Add Property. The property now appears in the list of existing properties, on the Contact Profile page, and in the Contact Gallery. 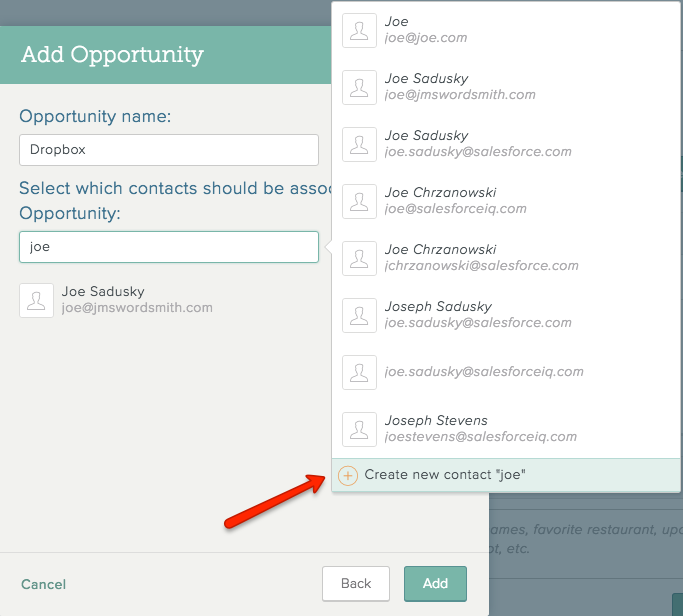 Any field you add in the Contact Gallery is a custom Contact property. 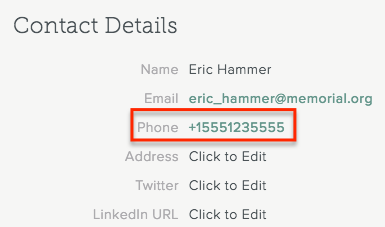 After you add the field, the property appears on the Contact’s Profile page. 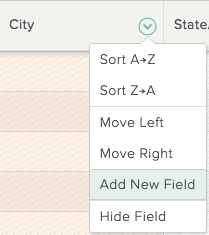 Click the downward-facing arrow to the right of any field header and select Add New Field. Select the property field type—Single Select in this example. Enter the property details and click Add Property. 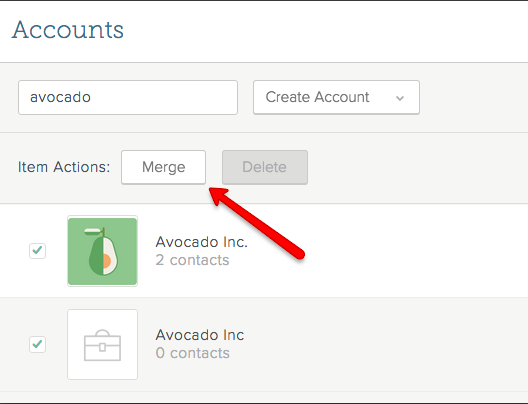 For any Account you set up in SalesforceIQ, you can edit the Account name, merge with another Account, or delete the Account. You can change the name of an Account from the Account Profile screen. In upper-right corner of any SalesforceIQ screen, click . Enter the Account name in the search field. Select the Account from the search results. On the Account Profile screen, hover over the Account name, and then click . 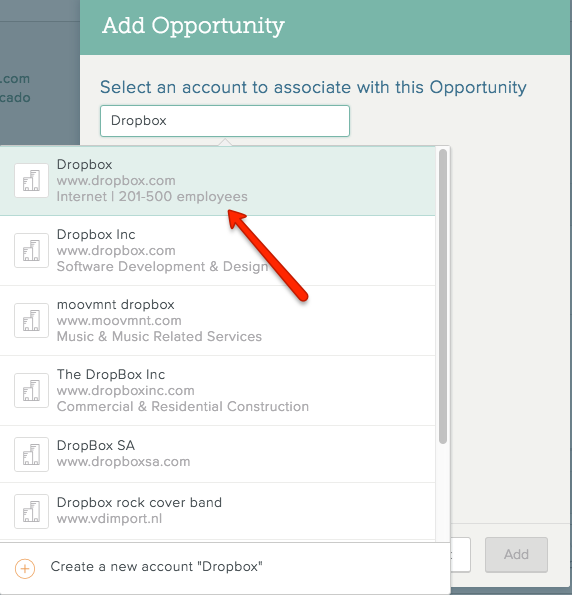 Note: To change the name displayed for an Account on a List to track that specific opportunity, see the help article here. 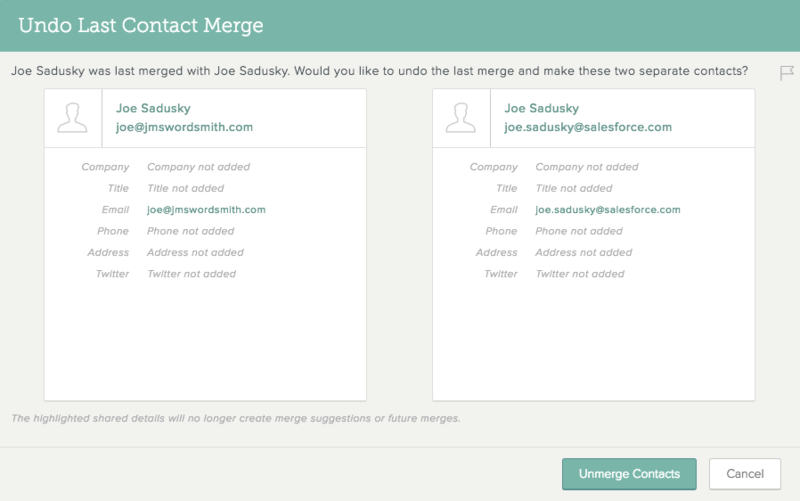 If a member of your Organization creates duplicate Accounts for the same company, you can merge the Accounts and retain all of the List data in one profile. 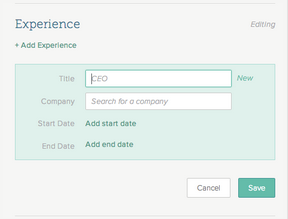 In the search field in the upper-right corner of any SalesforceIQ screen, enter the first Account you want to merge. On the Account Profile screen, click . On the screen that appears, enter the name of the second Account you want to merge, and select the Account from the search results. Click at the top of the screen, and then select Accounts. Check the boxes to the left of the two Account names you want to merge. 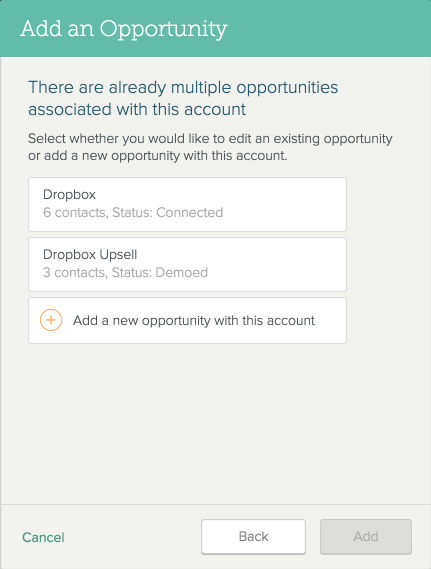 After you merge the two Accounts, you will have a single Account profile showing all of the Account leads, opportunities, etc. by List name. You can delete an Account from SalesforceIQ only if it has no Lists associated with it. In the search field in the upper-right corner of any SalesforceIQ screen, enter the Account you want to delete. 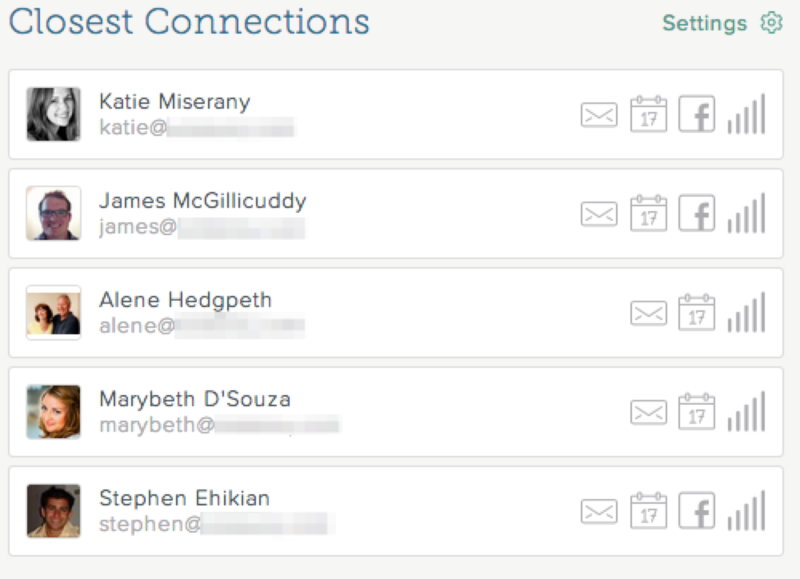 On a Contact's Profile page, the Closest Connections section shows the people in your Organization who have the strongest connection to that Contact. 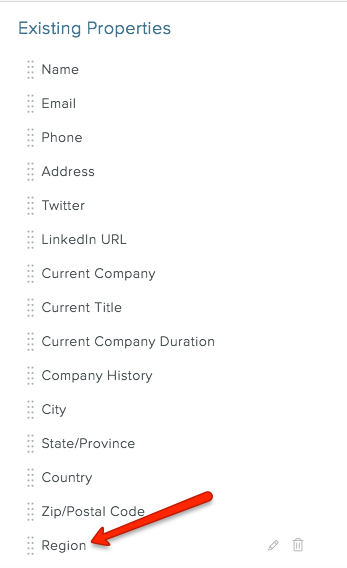 On an Account Profile page, the Closest Connections section shows the Contacts attached to that Account who have the strongest connection to your Organization. 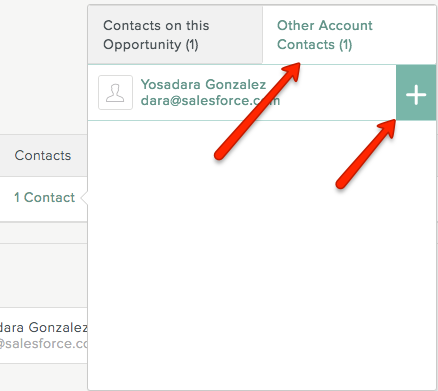 Closest Connections appear only on the Contact profiles for Contacts in your Organization's address book. 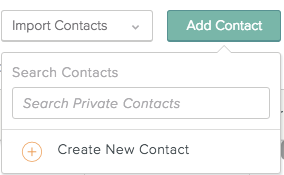 Contact profiles for your private, unshared Contacts don't display a Closest Connections section. Learn more about the difference between Organization Contacts and personal Contacts here. 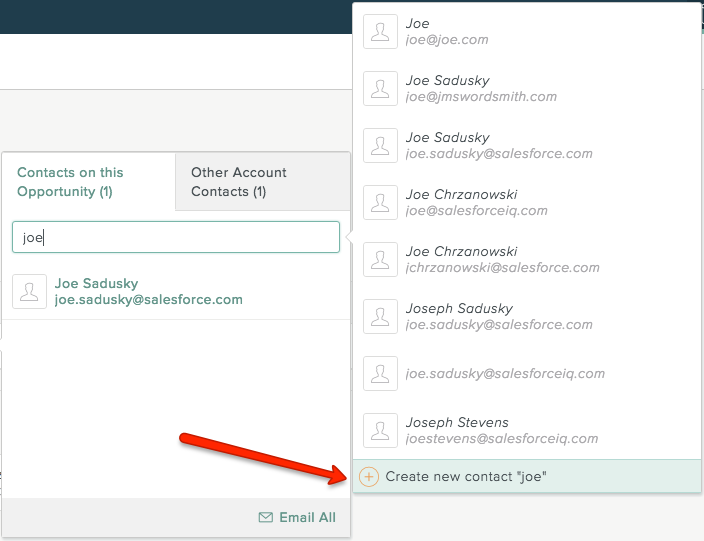 When you turn on activity sharing, SalesforceIQ automatically shares the connection strength for each of your Contacts on the Contact profile page.